In the red corner, your home base on Facebook for you as an individual, not as a business — the ever popular Facebook Profile. In the blue corner, the king of “Likes,” the master of Insights, and basically the profile for your business or organization — the Facebook Page. Which will reign as the undisputed champion of social media marketing for your business or organization? 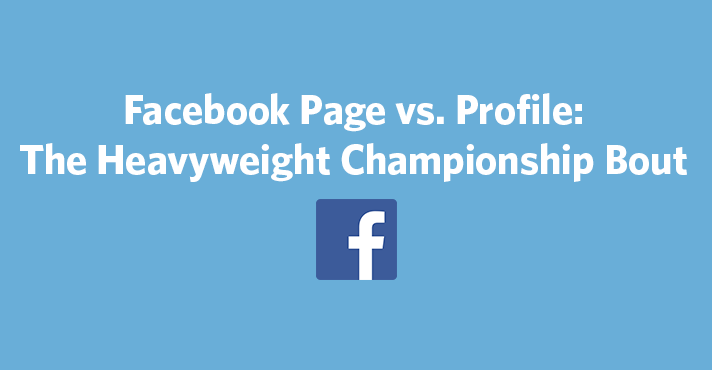 Grab yourself a ringside seat for … Facebook Page vs. Profile. How do these opponents match up? As you take the dive into marketing with Facebook, you’re probably wondering which you should be using, the Facebook Profile or the Facebook Page. Or maybe you’ve already created a Profile for your business instead of a Page, and you’re wondering if or why you should bother to switch. Well, I have bad news for you if you’re rooting for the Facebook Profile to win this battle and use it to handle your marketing like a champ. Sure, the Profile is great for doing things like communicating with your family and friends, sharing photos, videos, and links with them, and connecting with your favorite brands, celebrities, and causes. But here’s the catch …Facebook set up the Profile to be used by you the individual, not you the business or organization. According to Facebook’s Statement of Rights and Responsibilities, using a personal Profile for anything other than an individual person is a direct violation. And Facebook could shut down your Profile without recourse if they discover you’ve been violating their terms. How’s that for a swift punch to the kidneys? This means that when people interact on your Page by liking, sharing, or commenting on your content, it shows up on their personal Profile and in their friends’ newsfeeds — which is great news because your Page and your content gets in front of both groups of people, those who’ve already “Liked” your Page and those who haven’t … yet. You can do this by using tabs and other applications. So, whether you want to use your Page to feature lots of great content or just want to run coupon campaigns or contests, you can use your Page to do so in ways that Facebook doesn’t allow on your personal Profile. Facebook Insights allow you to see what type of content is getting the most engagement on your Page. You can also see what types of people are Liking and interacting with your organization. And if you run a promotion, you can monitor your Page’s growth, as well as see stats on conversions and click-throughs. Ding. Ding. Ding. That’s a knockout! As you can see, the battle of Facebook Page vs. Profile isn’t really much of a fight at all. When it comes to marketing your business or organization on Facebook, there’s only one true champ, and that’s the Facebook Page. Ready to set up your Facebook Page? Visit the Social Media Quickstarter and find out how. Still using a profile for your business or organization? Here’s how to convert your Profile to a Page.